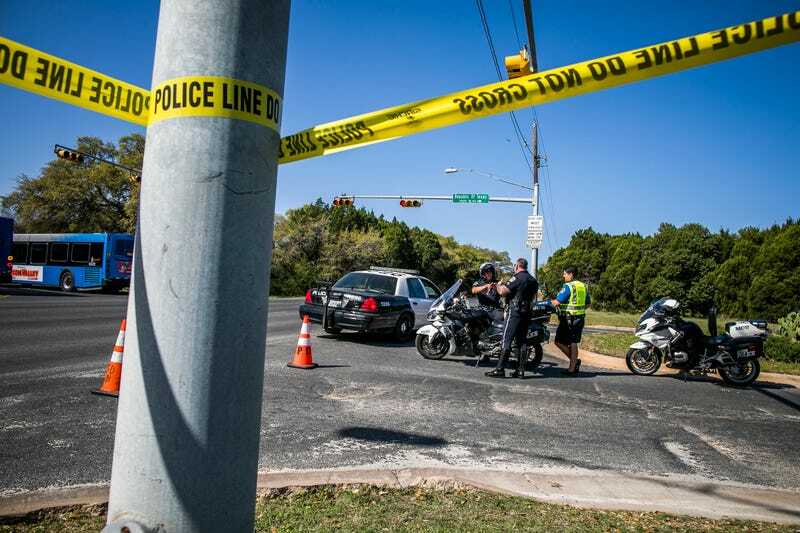 Police tape marks off the neighborhood where a package bomb went off March 19, 2018, in Austin, Texas, one of several in the Austin area in recent days. Updated Tuesday, March 20, 2018, 3:07 p.m. EDT: Apparently there is no second device after all. On Tuesday morning, San Antonio Police Chief William McManus said that there was a second, unexploded device found at the Schertz, Texas, FedEx location after a first bomb went off. A spokesperson for the department later backtracked, saying that McManus “misspoke” when he made those comments. “We have provided law enforcement responsible for this investigation extensive evidence related to these packages and the individual that shipped them collected from our advanced technology security systems,” the FedEx statement read. Updated Tuesday, March 20, 2018, 2:02 p.m. EDT: A second package bomb that did not detonate at a Schertz, Texas, FedEx facility was discovered by police on Tuesday. As the Washington Post reports, it is believed that the second device could be key in expanding the investigation into the string of bombings that have rocked the state’s capital and set the entire state and nation on edge. The second device, since it did not explode, could provide key evidence to help law enforcement identify the person or people responsible. Early Tuesday morning, a package bomb that was on an automated conveyor belt at the FedEx center in Schertz went off. No one was injured at the time. A package that was believed to be en route to Austin, Texas, exploded at a local FedEx facility just outside of San Antonio, prompting officials to look at the case as possibly being connected to a series of blasts that have occurred in the state capital over the past month. FBI agents were on the scene, which came after four bombings in Austin. “We believe that the explosion is likely connected” to the earlier explosions, FBI spokesperson Michelle Lee said, according to NPR. The package exploded around 12:25 a.m. local time in the sorting area of the Schertz, Texas, facility. One employee was treated and released at the scene. As noted, it was the fifth explosion of a package bomb in recent days. After a fourth explosion over the weekend, believed to have been set off by a trip wire, investigators said that a “serial bomber” was behind the attacks that have killed two people and injured multiple others. The specific destination of the package, the Washington Post reports, was not disclosed. Authorities have declined to describe the bombs, citing the investigation, only saying that they were sophisticated devices crafted by someone who knows what they are doing. Authorities are now encouraging residents or anyone who may see a suspicious package to steer clear.